Obama's Praise For Vick's Second Chance: Good Call? : The Two-Way President Obama has told Philadelphia Eagles owner Jeffrey Lurie that he's glad the team gave quarterback Michael Vick a "second chance" after his release from jail. Obama's Praise For Vick's Second Chance: Good Call? 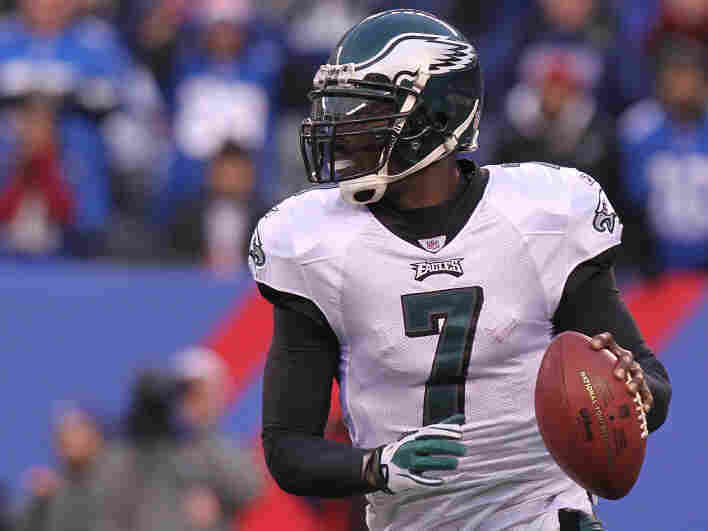 Quarterback Michael Vick of the Philadelphia Eagles during a game against the New York Giants on Dec. 19. President Obama has told Philadelphia Eagles owner Jeffrey Lurie that he's glad the team gave quarterback Michael Vick a "second chance" after his release from jail, where the player served 19 months for his role in, as The Washington Post says, "a horrific dogfighting ring." White House spokesman Bill Burton told reporters yesterday that while Obama continues to condemn the crimes Vick committed, "he does think that individuals who have paid for their crimes should have an opportunity to contribute to society again." The Post goes on to say that the president's message to Lurie about Vick is just the latest sign that Obama "doesn't seem to shy away from the divisive social and cultural topics that Americans are debating in their living rooms, gyms and workplaces." "The ASPCA would like to remind the public that Michael Vick pled guilty to helping torture and kill dogs because they didn't perform well in his dogfighting ring. While we do believe in second chances, we also support the conditions of Michael Vick's probation, which prohibit him from owning, buying or selling dogs for three years from the date of his July 2009 release from federal prison. Mr. Vick's performance on the gridiron may continue to attract attention and accolades, but we believe the final measure of his newly found compassion toward animals can only be borne out over time."